which is renowned for its excellent hiking trails. 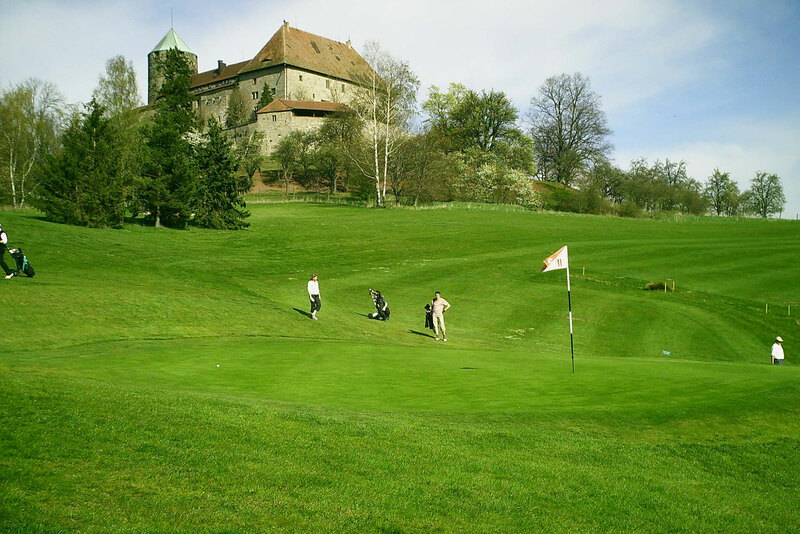 The delightful and traditional Ansbach Golfclub golf course lies at the foot of the castle. From the highest point of the 18-hole course with driving range, the golfer will be rewarded with a wonderful view of the upper Altmühl Valley. If you are interested in golf, why not try out the game at reasonable rates on the public 6-hole course. Colmberg Castle is very centrally situated in romantic Franconia, directly on the Burgenstraße (Castle Road) between Ansbach and the world-famous Rothenburg ob der Tauber. Colmberg Castle is the starting point for splendid hikes (St. James’ Way, Radschmetterling cycle trail) The medieval towns of Rothenburg ob der Tauber, Dinkelsbühl and Feuchtwangen are popular excursion destinations. Come and visit the Franconian Open-Air Museum in Bad Windsheim and relax in the Franconain lake district, a bathers’, surfers’ and sailors’ paradise. The cycle trail follows the Altmühl river for 167 kilometres (ca. 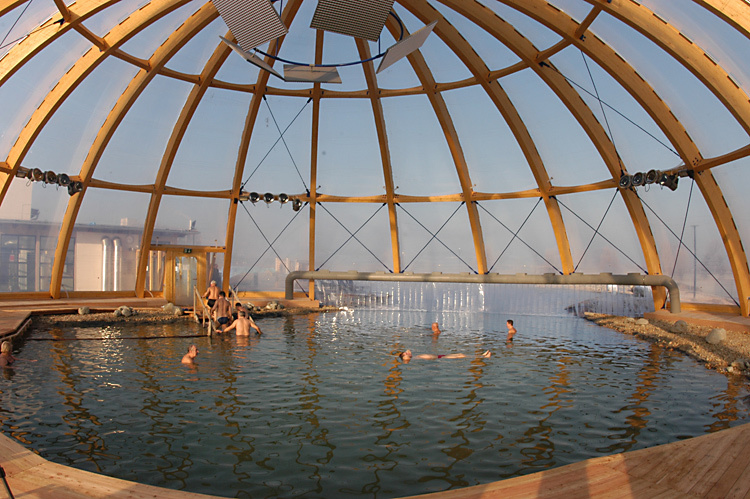 100 miles) from its source to the Danube. 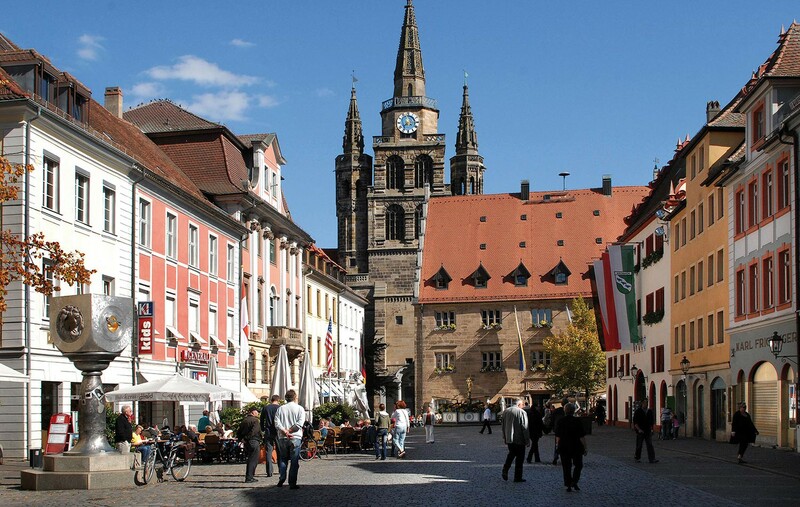 Family-friendly, level and in the midst of nature, far from the street noises, cyclists ride the Altmühl cycle trail – along sunlit juniper moorlands and bizarre rocky outcrops, past ancient Roman buildings, castles and palaces, as well as churches and cloisters. A cycle trip on the Altmühl cycle trail provides a special perspective on an attractive countryside. The region has plenty to offer culturally as well. The Altmühl Valley was once colonised by the Romans. In the distant past, the legionnaires gathered in the border area between the Roman Empire and Germania, through which the Limes Wall ran. They left their traces. 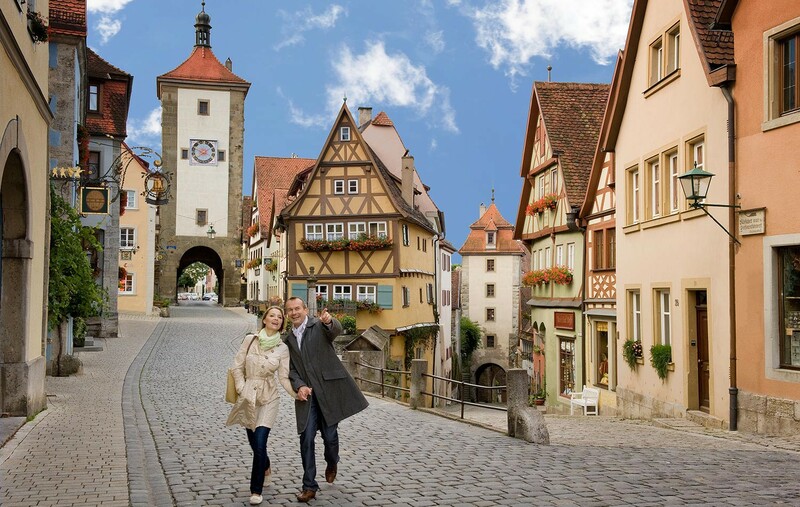 Spas, castles and fortresses line the stretch from Rothenburg ob der Tauber to Regensburg. 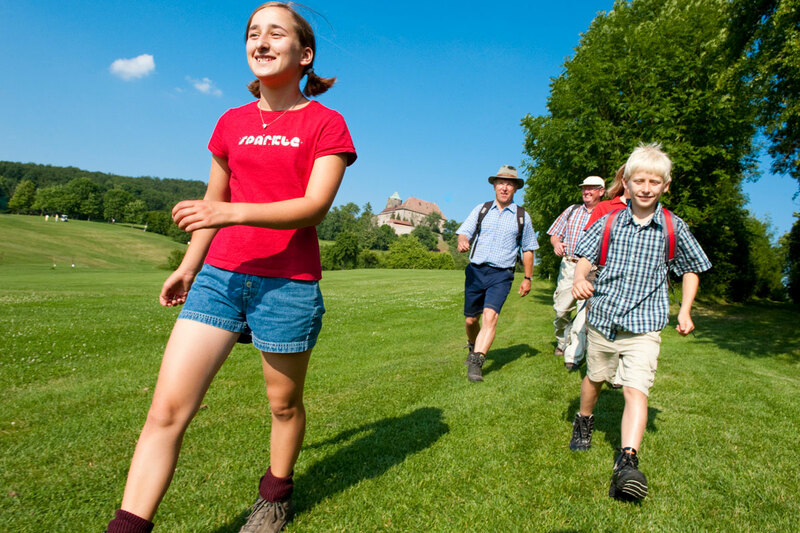 Ramble through the gentle low mountain ranges of the Frankenhöhe (Franconian Heights) Nature Park. Wonderful stretches through forest and plain, often on small path, narrow forest tracks or across open fields, and are a joy to nature lovers and hikers. The moderate variations in height are pleasant and easily manageable. 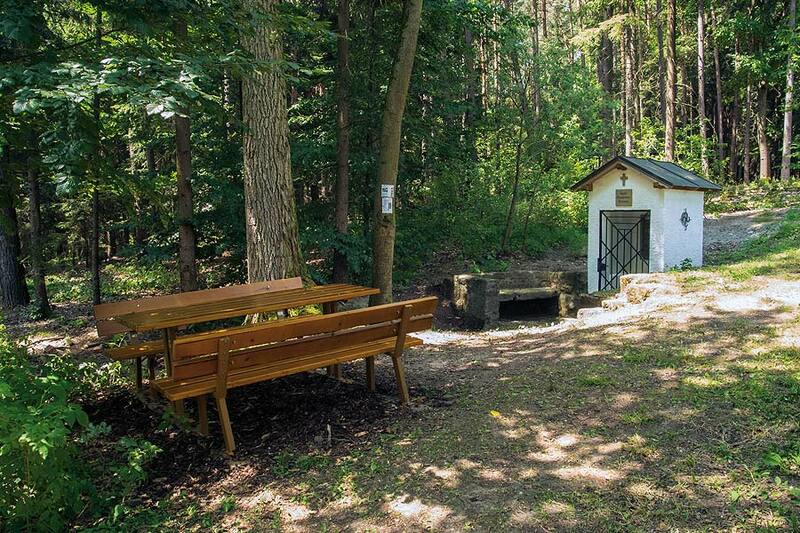 The European Watershed runs through the the heart of the Frankenhöhe Nature Park. The hiking trail meanders along this line, crosses it often and, on some stretches, runs exactly on the watershed itself. The Watershed Trail has been awarded the certificate “Qualitätsweg Wanderbares Deutschland” (Quality Trail of Walkable Germany) by the German Hiking Association.